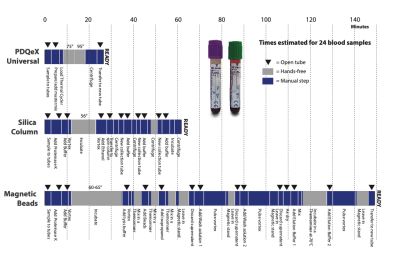 prepGEM Universal is MicroGEM’s comprehensive solution for effortless high-yield DNA extraction from blood, saliva, and tissues. It is also perfectly suited for extracting DNA from cell cultures. All within a single tube, this method ensures no loss of DNA, and as a result, it excels with low cell number extractions. This kit is an excellent tool for researchers performing confirmatory genotyping of transfected cells following CRISPR/Cas9 gene editing. prepGEM Universal utilizes our thermophilic proteinase by activation with a simple temperature change. The whole process is easily automated in a single tube using standard laboratory equipment. A standard thermocycler can be programmed to carry out the extraction. MicroGEM’s single-step, closed-tube, temperature-controlled lysis and extraction is a robust solution for loss-less DNA extraction from cultured cells. When working with cultured cells, it is often necessary to isolate DNA from a large number of samples presented in small volumes. These are not limitations for MicroGEM extractions. prepGEM Universal gives linear results from 200,000 cells down to a single cell. Working volumes can be scaled to sub-microlitre volumes making it perfect for working with low cell numbers. Speed, yield and integrity make prepGEM Universal the ideal nucleic acid extraction method for researchers working with cell cultures for gene editing and expression. Many universities, research hospitals, government entities, and private companies, have already adopted prepGEM Universal into their workflow. The single-step, closed-tube temperature-controlled lysis and extraction is highly desirable because MicroGEM extraction buffers are compatible with downstream reactions. Primers and PCR reagents can be added directly to the extract with no further purification. For RNA extraction from cultured cells, please see our RNAGEM product. Insects eat between 5-20% of the most important grain crops produced around the world. Further, insect-related vector-borne diseases account for more than 17% of all infectious diseases, causing more than 700,000 deaths annually and millions of cases of dengue, malaria, trypanosomiasis, Lyme disease and many more. Much of this destruction and disease is preventable with timely interventions and prevention strategies. Identification of a pest insect species typically requires an adult-stage sample. However, advances in molecular approaches allow for the detection and characterization of insects using insect eggs and in the larval stage. There are many reasons why it is important to identify an insect at the species level such as guiding insecticide control measures, identifying quarantine pests, and distinguishing disease vector insects. These types of assessments need to be conducted with high levels of accuracy while maintaining high rates of throughput. The DNA extraction process is often complicated when the sample material is very small and difficult to manipulate such as the legs of insects, larvae and/or eggs. Historically, extracting DNA from a small sample may result in tremendous variations in yield and quality. Insects can contribute to loss of crop due to transmission of plant disease or by the insect feeding on the crop. Identification of a pest insect species typically requires an adult-stage sample. Detection and characterization of insects using molecular approaches allow for testing of insect eggs and in the larval stage. Studies show that prepGEM is ideal for detection of pest organisms and for the characterization of potential biological control agents. A commonly used model organism is the nematode, C. elegans. prepGEM has been used to study populations of C. elegans with focus on genetic diversity and reproduction. prepGEM has been used in aquaculture to extract DNA from larval rock lobster to determine the species of the sampled organisms. It has also been used to develop a low-cost extraction of DNA from shrimp for genotyping in a breeding program. Biomedical research frequently uses rodents as animal models. In many cases, precise genotypes of the animals are necessary, but often this step is time-consuming. With the number of animals required to generate data, reagent and labor costs can become prohibitive. This problem can be solved with efficient, low-cost DNA extraction. PDQeX prepGEM Universal is an automated solution for producing quality DNAs in a low-cost automated system. The DNA is ideal for PCR and qPCR and, with qPCR/HRM, can be used for sexing the animal far more reliably than judging the anogenial distance. prepGEM Universal leverages our thermophilic proteinase which is activated with a simple temperature change. The whole process is easily automated in a single tube using standard laboratory equipment. A standard thermocycler can be programmed to carry out the extraction. 5 µl of whole blood from an EDTA BD Vacutainer® and fresh blood from a finger-prick was extracted using the PDQeX prepGEM kit. 5 µl of the extract (total volume 100 µl) was used in a 20 µl qPCR reaction. The plots of the two samples are shown below. 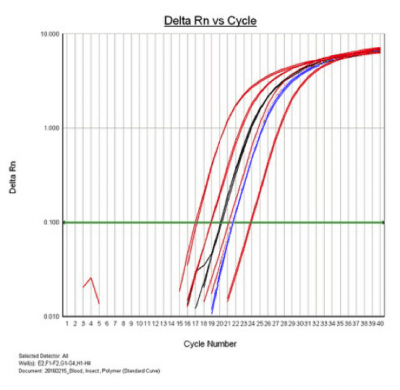 BRCA 1, qPCR plots showing fresh blood (Black) and EDTA (Blue) with human male standard DNA (Red) at concentrations of: 10 ng/µl, 2 ng/µl, 0.4 ng/µl, 0.08 ng/µl.